A demon king? Only one? I thought you said this would be difficult. Now, stop rolling your eyes. I'd expect more from someone who, not three days ago, threw himself at our feet, crying and wailing that only the great hero Enikir the Bold could save the kingdom from certain destruction. Our plan is simple. Firstly, Animdar the Arcane will magically seal the main gate. The demon king has 5,000 soldiers at most. With that few, Animdar will have no trouble defeating them. Meanwhile, I'll leap throught the stained glass window set above the altar, land between the demon king and the princess just before they complete their vows, and whisk Her Highness away through the crowd. Cultoc will then shed his disguise as the evil high priest's acolyte, spash the demon with the sacred waters of the virgin's fountain, and banish the demon forever back to his infernal home. If things should go wrong? Don't worry, we'll improvise something. - Enikir the Bold, Hero of the Four Wills. Fantasy games have long allowed players to take the roles of mighty heroes battling demons, dragons, giants, and other villains. 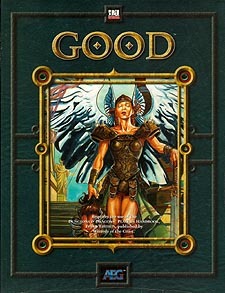 This sourcebook expands the options for good characters, presenting new maigc items, heroic orders, new paladin classes to give every facet of good its champions, and rules that allow the gods to have a tangible effect on a character's actions and choices.